Hampton Inn Pittsburgh Mcknight Rd. 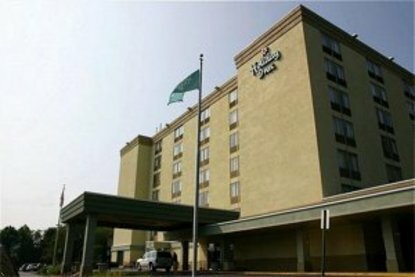 The Holiday Inn North Hills Pittsburgh Hotel has recently completed a $4.5 million renovation of all public areas and guestrooms. Just 6 miles from downtown Pittsburgh, via I-279 N, we're located in the North Hills of Pittsburgh. The Holiday Inn North Hills is a 7 story high rise hotel surrounded by hundreds of retail stores and restaurants. We are also conveniently located near Heinz Field, PNC Park, Mellon Arena, North Park, the National Aviary, Carnegie Science Center, Pittsburgh Children's Museum, Benedum Center, LaRoache College, University of Pittsburgh, Duquesne University, Carnegie Mellon University, Pittsburgh Zoo, UPMC, and Kennywood Park, Complimentary wireless high speed Internet access, voice mail, hair dryers, coffee makers and irons & boards are standard in each guestroom. For great food and fantastic service, stop by the Hilltop Restaurant and Lounge, open 7 days a week for breakfast. Dinner is served Monday through Sunday 5:00 PM until 9:00 PM. The Holiday Inn North Hills Pittsburgh Hotel is the ultimate social and business event headquarters -from conventions and corporate meetings to social gatherings and weddings. We have nearly 10,000 square feet of hotel meeting space which includes two ballrooms. Our professional staff is on-hand to make your event a success. This hotel is committed to providing accessible facilities under the American Disabilities Act. If your accessibility needs are not met, please contact the Hotel Manager on Duty. Should you require additional information regarding accessible facilities for guests with disabilities, please call 1-800-Holiday (U.S. and Canada) or contact the hotel directly. For the hearing impaired, TDD service is available at 1-800-238-5544 within the U.S. and Canada.